The US Defense Department's Advanced Research Projects Agency, DARPA's TERN is one of the most stunning autonomous aircraft projects to date. From the artist's rendering, it looks like Darth Vader will emerge. But it's under development and prototypes are already being tested. Northrup Grumman is leading the program. GE has developed the engines. What TERN is capable of doing and plans for its global utilization are breakthrough technology innovation. From virtually any naval vessel with a deck, TERN vertically takes off and lands like a helicopter and then transitions to a wing-born flight like an airplane on a mission. It can carry a 600 pound payload and fly 600 miles to strike a target. 85% of the Navy's battle-force doesn't have enough room on its deck to carry much more than a helicopter for air support. That's why TERN or Tactically Exploited Reconnaissance Nods program is so important. 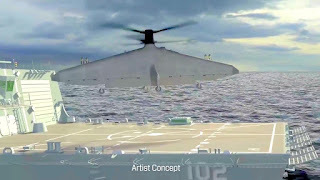 It puts medium altitude, long endurance, unmanned aircraft on board small vessels for launch. It has strike and ISR (intelligence, surveillance and reconnaissance) capabilities well beyond current helicopters. Earlier this year, GE participated in test flights of TERN's power system. In upcoming months, additional ground and flight tests of the engines in a TERN prototype will take place. That will be followed by at sea launches, flights and landings. Northrup has developed two TERN prototypes. The drone extraordinary is likely to take the shape of a perfect triangle, 40 feet on each side with 2, l0 foot counter rotating rotors, powered by GE engines. It's one of the US military's larger drones. To quote the developers: "It's a tail-setting, flying-wing aircraft with a twin contra-rotating, nose mounted propulsion system". At the moment, its a stunning piece of technology that clearly has not only a reconnaissance mission but importantly a military strike mission. Like all of DARPA R&D programs, its's designed to provide the US military with overwhelming technological advantages.